You guys already know I’m a 24-year-old who had to move back in with her parents after college. I’m not super proud of it, and I know I’m lucky. I also know I’m not the only one. Right now, more 18 to 34 year olds live with their parents than any other living arrangements than ever before, Pew Research Center reports. Trade-Schools.net recently tapped into this demographic by surveying 800 college graduates who moved back home. The results are just as interesting as moving back home. How Long are Young Folks Living at Home After College? I’m right at the 10-month mark of my rent-payment hiatus at home. I’d told myself I’d move out by Christmas. Well, that’s come and gone. Then I said by my one-year mark… I’m still not feeling very proactive. I guess others felt similarly. 14% of respondents lived at home for less than six months. 24% of respondents lived at home for six months to one year. 24% of respondents lived at home for one to two years. 16% of respondents lived at home for two or more years. Who’s more likely to move home for two or more years, you ask? 25% were arts and theatre majors and IT majors. 25% were in the transportation and warehousing industry. I moved back home to save money. After graduate school, I didn’t have much to my name. I also secured a full-time dream job with benefits in my hometown, so that was also convenient. Other motivators included to take care of health or mental health, to grow closer to family (that’s real close), to invest and build credit, to avoid living solo or to pause before a big move. I also have to admit: I want to live on my own — but know I can’t combat the nasty roaches that live in Florida. Those who live at home for a shorter period of time (under two years) seem to be doing better on the financial front. Those who lived at home for less than two years reported making more money — about $6,000 more annually. That’s quite a chunk. But also, think about the whole “correlation isn’t causation” thing your stats teacher taught you. I have to assume moving out didn’t drive this salary increase. However, you better believe I’m out of Mom and Dad’s before that two-year mark (mostly because I’d like to feel like a real adult by 26…). Either way, I’m taking these steps to expedite the move-out process so I can start adulting. 1. Set a concrete move-out date. I swear, guys, I’m working on getting over my fear of roaches and rent payments and working to set a move-out date. I suggest being realistic. Know what you’ll pay in rent and monthly expenses versus what you’re making. Set a timeline and a budget. This sounds odd, but stick with me. Scope out rentals where you want to move and see how much you should plan to spend each month after moving out. Once you’ve started saving some money by living at home, go ahead and start paying rent. I know you don’t rent a place, but just set this money aside so when you move out, you’re already set for, say, six months. You’ll want to put this in a separate account, though, so you don’t spend it. One of our favorites is the Aspiration Account — there are no monthly fees, and you’ll earn up to 100 times the interest rate of other banks. So while I’m saving for my future rent, I’m also watching my money grow. Plus, ATMs are free anywhere in the world, which is nice, if I have an emergency. 3. Build an emergency fund! When you venture out on your own, you never know what might happen. That’s why you’ll want to have enough cushion for an emergency fund, or a rainy-day fund, as some people call it. That way, if something goes wrong, you’re covered. Like that pretend rent, you’ll want to stash this in a separate account to keep it away from your grimy spending hands. Experts suggest you save at least six months of living expenses. 4. Focus on paying off those student loans. More and more Americans are defaulting on student loans, which isn’t awesome. If case you don’t understand, defaulting on loans means you stop making payments. If you don’t pay anything in 270 days, your debt increases due to late fees plus interest, and extra collections fees could be tacked on. Long term, you could become ineligible for more federal student aid, hurt your credit score or risk losing a tax return or paycheck. So, yeah, paying off those loans is important — especially while you’re saving money living at home. 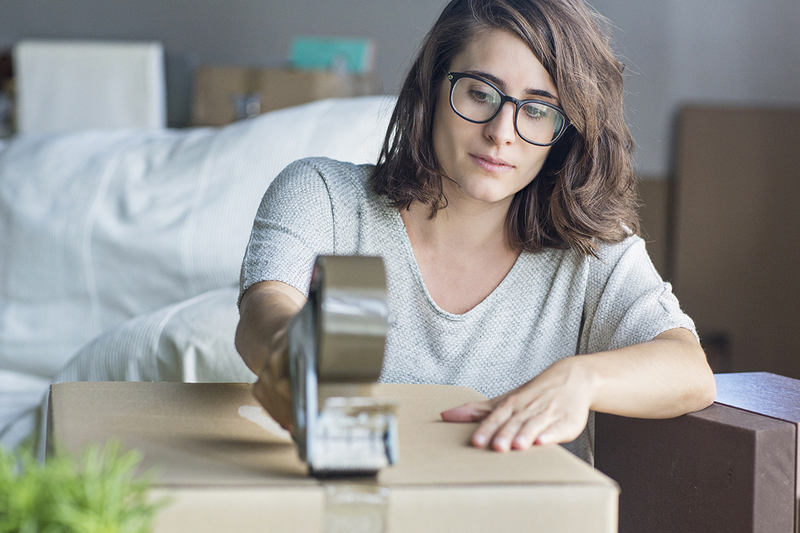 You’ll feel best moving out without a chunk of debt to your name. I promise. 5. Stop holding onto stuff. Chances are, you’ve moved back home from college with a ton of stuff — maybe triple what you left with? The easiest way to get rid of the extras and make some bucks is to sell it online with an app like letgo. This intuitive app lets you set your own prices. Plus, it’s easy. All you have to do is a take a photo of the item and upload it. The platform operates like Craigslist in that you’re advertising to people in your area, so there’s no need to mess with shipping. For old textbooks, consider using BookScouter. The site tells you what the book is going for and where it’s best to sell it. Your Turn: Do you have any tips of your own for us poor graduates who’ve moved back home?